186 pages | 2 B/W Illus. 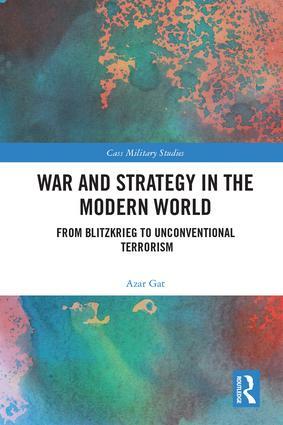 This volume brings together some of Professor Azar Gat's most significant articles on the evolution of strategic doctrines and the transformation of war during the 20th and early 21st centuries. It sheds new light on the rise of the German Panzer arm and the doctrine of Blitzkrieg between the two world wars; explores the factors behind the formation of strategic policy and military doctrine in the world war era and during the cold war; and explains why counterinsurgency has become such a problem. The book concludes with the spread of peace in the developed world, challenged as it is by the rise of the authoritarian-capitalist great powers – China and Russia – and by the chilling prospect of unconventional terrorism. This last essay summarizes the author's latest research and has not previously been published in article form. This collection will be of much interest to students of strategic studies, military history, and international relations. The Return of the Authoritarian-Capitalist Great Powers: Is the Democratic Victory Preordained? A Compass to the Arab Upheaval: What Can 19th Century Europe Teach? Azar Gat is Ezer Weitzman Professor of National Security at Tel Aviv University. He is the author of eight books, including A History of Military Thought: From the Enlightenment to the Cold War (2001); War in Human Civilization (2006); Victorious and Vulnerable: Why Democracy Won in the 20th Century and How it is still Imperiled (2010); and The Causes of War and the Spread of Peace: But Will War Rebound? (2017). His books have been translated into Spanish, Japanese, Chinese, Korean, Greek, Turkish, and Hebrew.